After a short break of five days, today am back to blogging and feeling happy for the same. I planned to share few Valentine's Day special recipes but because of my personal issues I could not make it up this time. Except this pink Strawberry milkshake i don't have any related recipes for the occasion. Since Pink & Strawberries are a part of Valentine's Day celebration. Any one there who doesn't like these two? I know the answer will be a big No. So a simple, hearty and delicious Pink treat for your loved ones. 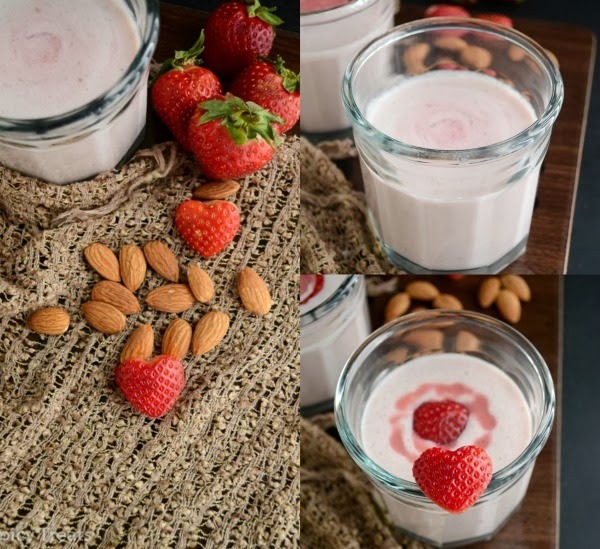 This is a simple Strawberry Milkshake with Vanilla Ice cream and Almonds. Almonds have paired well with strawberries and milkshake tasted so delicious. More than my kids i loved it a lot. 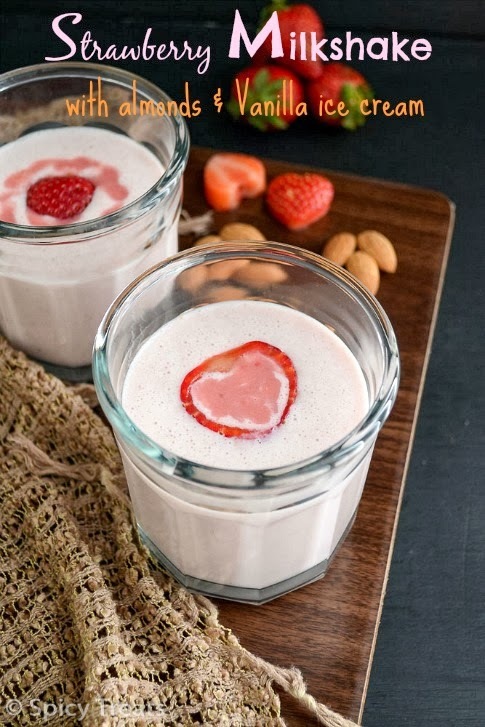 Instead of a plain fruity drink just try adding some soaked nuts to it for a even more filling and tasty milkshake. Wash Almonds and soak it Over night or take it in a microwave safe bowl with enough water and cook in microwave high for 2 minutes. Once done remove from the oven and leave it aside for 20-30 minutes. Meanwhile wash and chop strawberries roughly and keep ready. After 30 minutes peel the skin from almonds and first blend almonds with half cup milk for few seconds then add all the other ingredients in blender and blend it till smooth and frothy. Then pour it to the serving glasses and top it with whipped cream and strawberry slices or cherries. 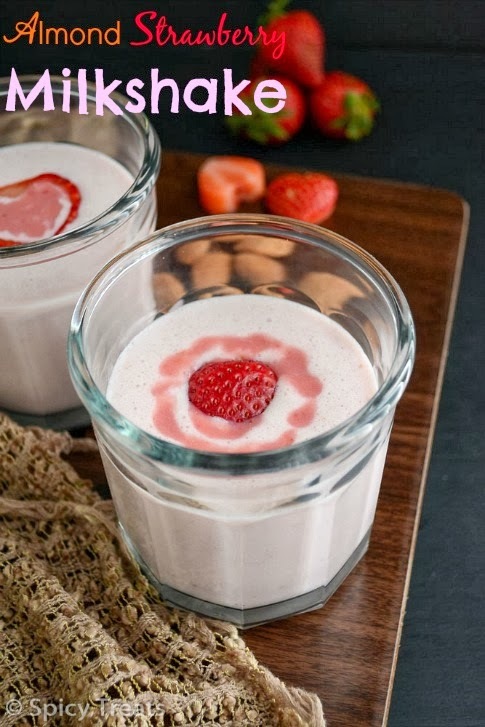 You can skip Almonds and make it as a plain Strawberry Milkshake. For more strawberry flavor use Quality Strawberry Ice cream, you can use 1/2-3/4 cup ice cream for more rich & taste. Instead of Vanilla Extract You can also use Almond extract if using almonds. You can also add 1-2 tsp of strawberry preserve or jam for extra flavor and taste. For a low fat version skip ice cream and use milk, almonds and strawberries. If you soak almonds overnight, then no need to microwave cook. Microwave cooking is for instant method. Sprouted or soaked almonds helps in easy digestion, so its better to use soaked & peeled almonds. 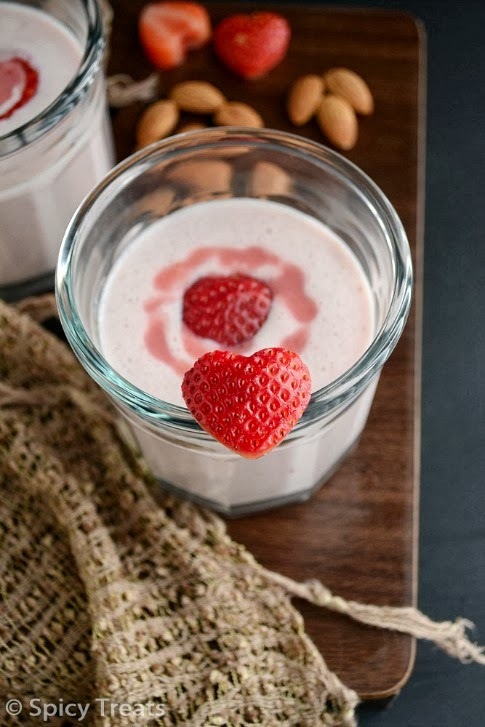 loving the strawberry hearts :) Milk shake looks very tempting and creamy :) awesome clicks !! lovely strawberry hearts..Happy Valentines day dear.. Happy Valentine's Day Sangee, delicious milkshake and the clicks are so good..